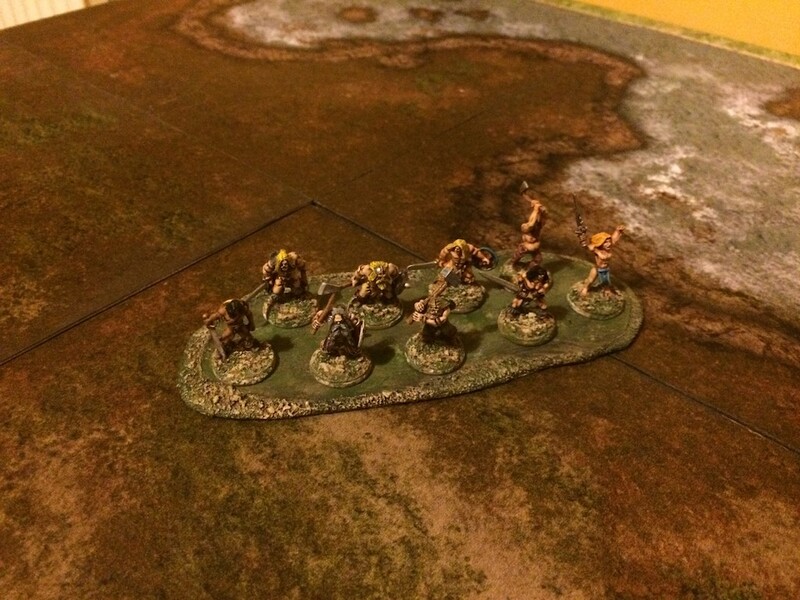 Magnetic Mutli-basing for Individually Based Miniatures on Variable Sized Bases! I remain stumped with how best to approach multi-basing 15mm for Hordes of the Things (HotT) and DBA whilst still retaining individually based miniatures. A future, and no doubt longer and inconclusive, post will follow at some point on that specific subject. 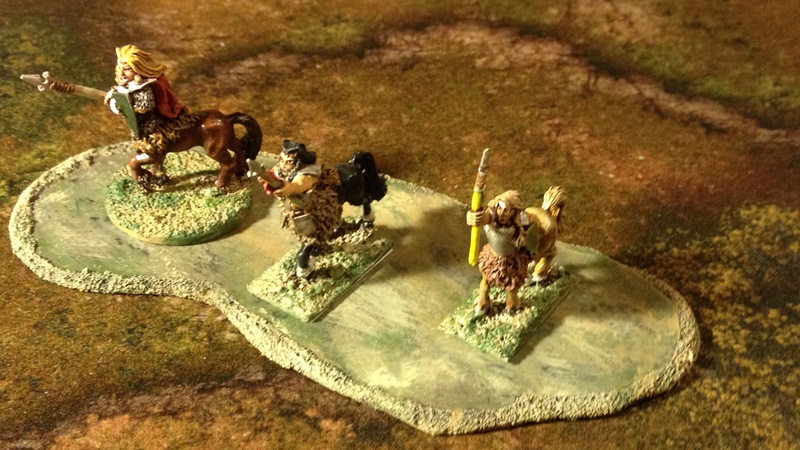 However, not all game systems are quite so tight on the basing criteria. A recent foray in to Of Gods and Mortals (OGAM) by Ganesha Games is pretty flexible on both size and shape of unit bases. So a few experiments based on magnetic bases with regards to HotT led me to try something similar. Flexible for various base sizes (infantry on washers, pennies and steel-paper based squares, cavalry on steel-paper based rectangles and tuppences or washers – i.e. all with magnetic properties). Flexible enough that casualty removal is an option and unit sizes can vary yet still ‘look’ okay. 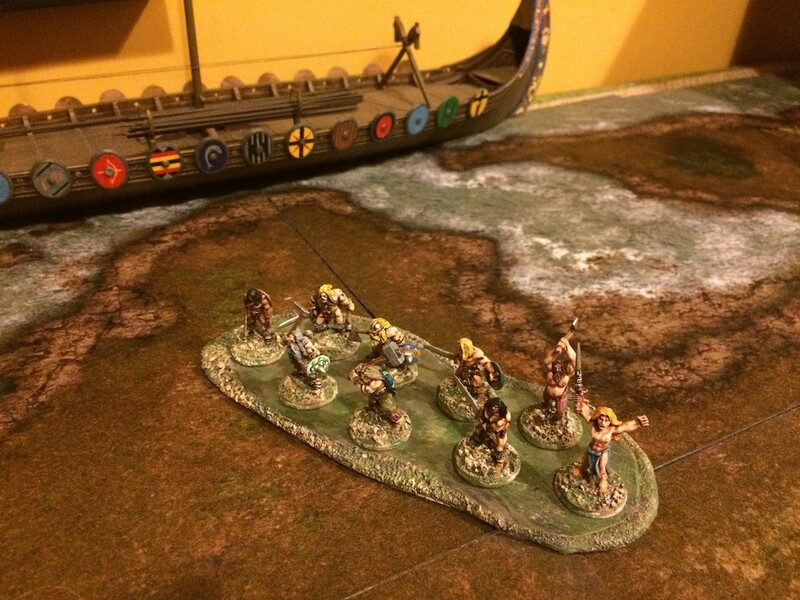 Strong enough magnetically that miniatures can be transported on the unit bases (which is also based with steel-paper for transporting in file boxes lined with magnetic sheets). In the end I made two sizes. 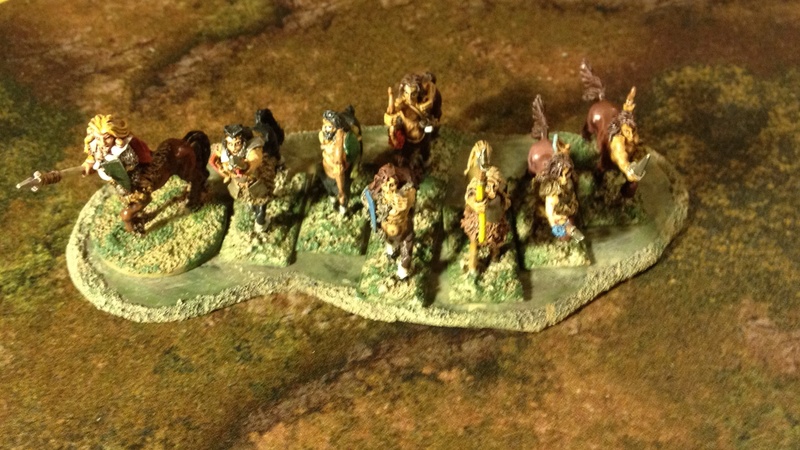 The one pictured is the larger and can accommodate around 8 cavalry or 12 or so infantry. The smaller is about half the size. 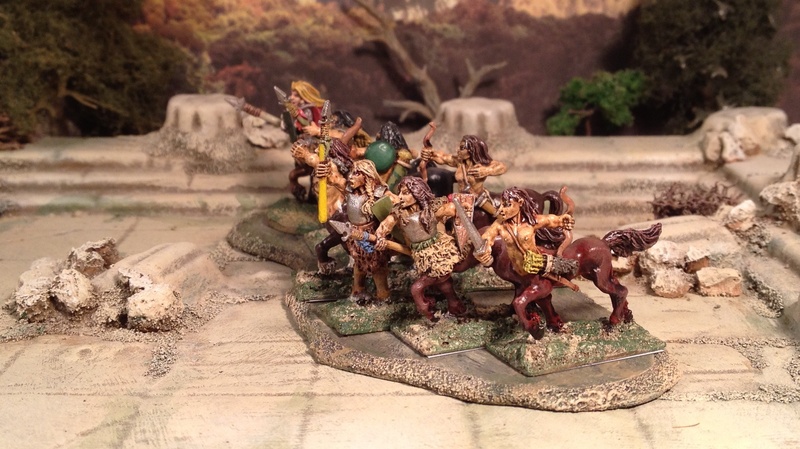 Note – these are for “Open Order” troops in OGAM. 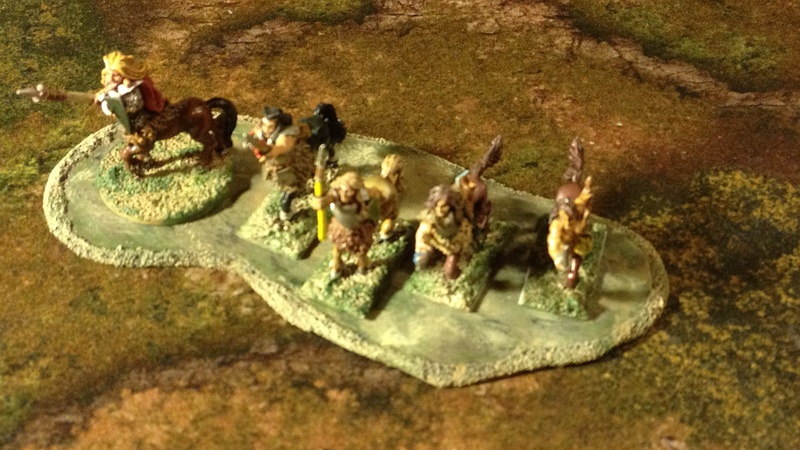 I have the rectangular 60mm x 40mm (and other depths) for “Close Order” units (see Future Post regards HotT/DBA basing…). I also think it’ll be good for the likes of Dragon Rampant and SAGA in 15mm. Pics borrowed from a future post. Footnote – The content of this post was generated last year (thoughts, pics and words) but I am only posting this now. Since then I’ve grown to like these flexible magnetic bases and have used them on a couple of outings and use them for general storage and moving figures around. I’ve made a bunch more. Enough to field a couple of modest sized armies. I often think about rebasing all of my medieval/fantasy figures on magnetic sabots. The figures can then be removed as casualties. But then I look at the massive numbers that would have to be rebased and the thought gets quickly tamped down back into the brain! On that path lies madness. It is for that reason I’ve tried coming up with this solution – most of my minis are on coins or washers (true, had to replace some of them which were not attracted to magnets). And sticking some steel card to a card or plastic base isn’t a big job. Maybe I will find the time and ambition to do this. They’ve been rebased once already, but that was back when the collection was smaller. What do you base stuff on at the moment? My a was to avoid rebasing which this achieves on the large part. 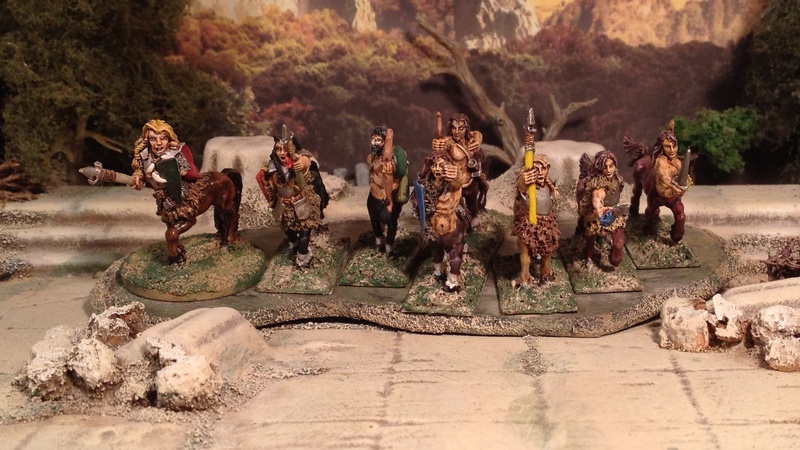 Nothing more boring than rebasing… well there are quite a few things actually.